Wasabi to sushi is like ketchup to fries, but with a much more pungent kick. However, wasabi is actually rarer than you may realize; there is a good chance you’ve actually never consumed real wasabi. Officially named Wasabi japonica, the wasabi plant grows naturally in river bends in Japan, China, Taiwan, Korea, and New Zealand. Wasabi grows in wet areas, and attempting to recreate its environment can be very difficult—some experts consider it the hardest plant to grow commercially. Real wasabi, until grated from the root, isn’t spicy. When grated in a circular, clockwise motion, a paste is formed and hot vapors are released, and traditional Japanese restaurants will grate fresh wasabi to order. Wasabi loses its strength after a mere fifteen to twenty minutes, so it needs to be served immediately after it's turned into a paste. Wasabi tends to be difficult to grow and extremely expensive. A pound of wasabi can reach up to $100 (although, who can eat that much wasabi?). If you were to be served a small serving of wasabi alongside your sushi, you would need to pay about three to five dollars for the wasabi alone. Horseradish grows faster than the wasabi plant (wasabi takes up to three years to reach maturity), so, even in Japan, it is often used in place of the real thing. Only about 5% of the wasabi served at restaurants around the world is thought to be the real thing. 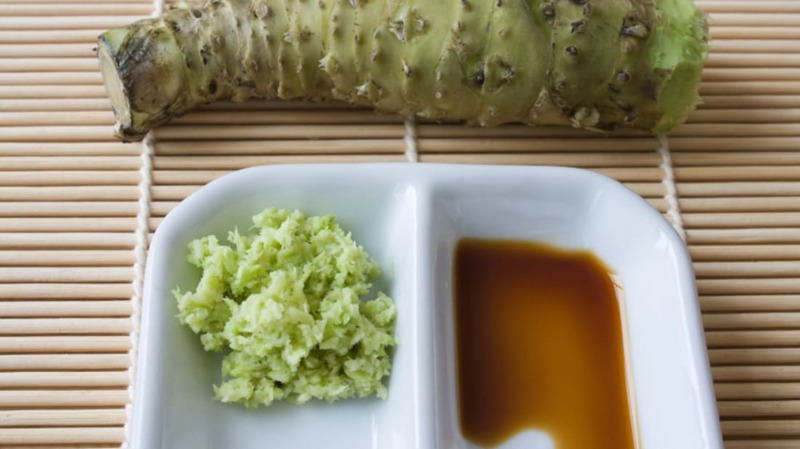 Actual wasabi is smoother tasting than the horseradish-mustard medley we commonly consume. Instead of creating a sensation in the tongue and mouth, real wasabi affects the nasal passages more. If the heat of the wasabi is making you break out in cold sweats, you’re probably not consuming authentic wasabi. Some Asian markets sell genuine wasabi roots, ranging from eight to ten dollars. You’ll know it’s real with a price like that.